CAMPINA GRANDE, BRAZIL (BNc) — The church arrived before the mission team in this city in northeastern Brazil! 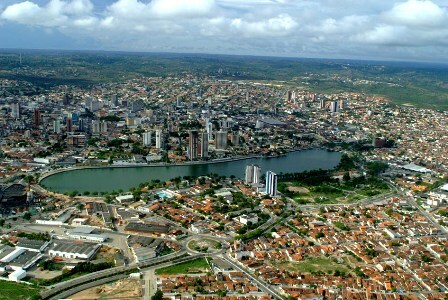 Campina Grande is the second largest city in the state of Paraiba, with a population of 400,000. Saints are preparing to take Christ there. The church is praying. Brazilian congregations are raising money to send two national families there, in addition to a missionary family planning to move there this year. I usually travel through Campina Grande on my way to anywhere in Paraibam so when I discovered that Izaias, an old friend whom I had not seen in over 15 years, had been transferred there with the Federal Police, I decided to try to find him. When I got there, I called him and his wife answered, whom I had never met. She told me how to get to the house. Izaias took off from work and came to meet me at home. We had lunch and spent the day catching up and talking about life, God and the Scriptures, until I couldn’t keep my eyes open anymore. I spent the night at their house and the next day went on my way. Three weeks later, Izaias called me and said three people had decided for Christ and wanted to be baptized and would I come do it? Of course, I went and, after a Bible study with the family, baptized Izaias and his two daughters, Patricia and Vanessa. I went on my way rejoicing. The church in João Pessoa is right now preparing three families to move to Campina Grande to begin the church there, hopefully in June or July. It is glad to know church growing in Brazil.You are doing good job for HIS kingdom.Keep up good work.My God bless you.